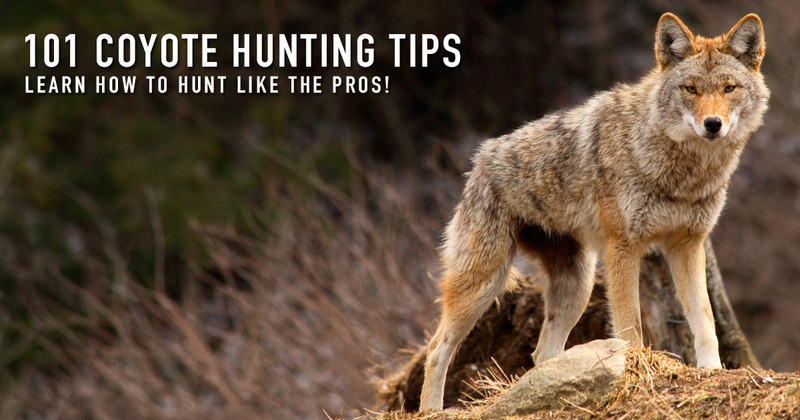 Learn to call coyotes like the pro's! There’s nothing like waking up early morning on a day you’re going on a coyote hunt. I can barely get out of bed for work at 7:00 am, but getting up at 5:00 am for a coyote hunt is no problem. I’m sure you share the same passion for hunting. I love every moment of it. I get all of my gear ready the night before, and I pack it using a checklist to make sure I have what I need. Hey! I just want the 101 tips, click here. Hunting Coyotes can be one of the most rewarding pursuits in your lifetime. It will make you laugh, cry, and scream in frustration. Most of all it will make you lose sleep at night, and daydream about predators coming in to the call. This website was designed to help you out in your pursuit of becoming a better predator hunter! On the way to the days hunting grounds I ponder over my scouting report. I think about where all of my stands will be and how many I think I can get in for the day. When I get near my first stand, the sun will be up within a half hour, and it’s almost shooting light. I still get butterflies just like when I was in high school and our team bus pulled into the opposing team’s parking lot. Predator hunting demands that you know the weather patterns, the temperatures, the ebb and flow. Will there be cloud cover or sunshine, rain or snow, wind or calm. Every detail down to barometric pressure counts as you try to build a library of hunting knowledge and experience. As I begin my walk into the stand I observe and absorb everything. The direction of the sun, the flow of the breeze. There’s a set of coyote tracks, they appear to be more than a day old. A broken branch off the shrub, a piece of fur hanging on the branch. Perhaps a chase happened here recently. Moving quietly I take it all in, registering and deciding how I will approach the stand. I love the thrill of the hunt! My name is Chad and I’ve spent several years working exclusively in the predator hunting industry. I worked day in and day out as a coyote hunter, testing varmint hunting equipment, and filming lots of high intensity predator hunts. With all of the action and time spent in the field with hunting professionals I picked up a lot of expert advice. I took the advice given and spent even more time alone perfecting my craft. Although I rarely pull the trigger, I do my best to capture coyotes on camera in one form or the other. Over the last twenty three years I have tried to find the best way to hunt coyotes. I have failed a lot at it. I still don’t consider myself a master, but I consistently call in coyotes and that stands for something. My best day included 9 coyotes, and I have had more goose egg days than I care to count. After trying just about everything I’ve found some tips and tricks that work for me. This website was built to cover all of the varmint hunting basics, the kind of questions that I constantly get. The tips represent my current methods, but those always change as I improve and learn new things. Make sure you get on the email list in order to hear about the new things I’m learning and having success with. Make sure you like our facebook page. We will be conducting several live hunts this coming year, so make sure you’re a fan of the page so you can catch all of the action. We are also very active on Instagram and YouTube so follow and subscribe! Coyote hunting gear: See what the pro’s use, and what I like to use on a daily basis. Everything from predator hunting apparel, shooting sticks, bi-pods, e-calls, mouth calls, decoys, weapons, ammunition, shooting chairs, gloves, and face-masks. Be sure to sign up on the email list for updated information, as I’m always testing the latest products in the field. You’ll be the first to know what I’m doing next. Scouting for Coyotes: Too many hunters go out and try to hunt em’ where they ain’t. Well I can tell you from experience that you can’t call a coyote if they don’t live where you’re calling. This section goes over private and public ground, scouting, locating, habitat, and several land features to look for while searching for that perfect spot. Arriving on Hunt Location: Now that you have your areas picked out, how do you get into your stand without scaring the critters away. I cover sun location, wind direction, movement, skyline, scent, and communication. Mastering these techniques will guarantee you putting more fur in the shed! Making a Coyote Stand: Selecting a stand can be very difficult and it can make or break your day of hunting by making a few simple mistakes. I cover elevation, wind, shade, camouflage, setting up your caller, decoy placement, and call direction. These simple steps will create good habits that will produce better results over the span of a hunting season. Using Electronic Calls: You have an electronic call, now what? I cover everything from, what sounds do I play? How loud should I play them? How long should I call? Can I switch sounds? How long is a typical stand? There are a lot of methods and ideas out there, but I will tell you what works for me. Using Mouth Calls: Learn the differences between an open reed call, and a closed reed call. See some great videos demonstrating their usage and professional techniques. One of my killer techniques involves a simple squeaker and I tell you how to make it a part of every stand! Coyote on Approach: Now that you’ve done all of that hard work, scouting, getting up early, and selecting the perfect stand; you’ve got a coyote on the hook and your adrenaline has just gone through the roof. The rush is addicting! I talk about simple things: Movement, coyote body language, watching your downwind, taking a moving shot, barking a coyote to stop, open spaces, and hunting in the thick. After the Shot: Boom! Hopefully you’ve killed a coyote, now what? It’s not unrealistic to call another one! Learning to control yourself after the shot will make you a better hunter. The Next Stand: Now that you’ve caused a ruckus in one spot, where do you go next? I cover simple questions like: What happens if I have a blank stand? How far should I move down the road until I make another stand? Should I hit the same place over and over again? These are all great questions, and I’ll help you decide the best technique for your situation. Skinning Coyotes: This is a tough and intimidating job for the first few times you do it. Rather than trying to walk you through the process, I embedded a video showing how it’s done. 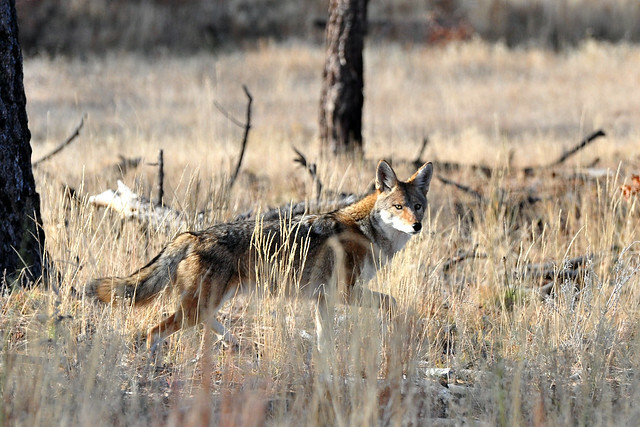 When to Hunt Coyotes: What time of year is best to hunt? Summer, spring, fall, or winter? What about time of day? Early morning, afternoon, what about moon phase? All of these questions are important to ask before you make plans for hunting that secret honey hole. Night Hunting Coyotes: This is becoming more popular by the minute. More people are attempting to hunt at night rather than spend their days going after a primarily nocturnal critter. Learn some basic techniques for night hunting, like stand selection, scanning, light color, and much more. Wrap Up: A final wrap up of all 101 tips. The second part of this site will focus on review of products. I spent countless hours with almost every imaginable product related to hunting coyotes. I am going to be honest with you and give you the information that you need to make the best buying decision on your products. If you have a question on a specific product contact me and I will do my best to answer you in a timely manner. Many of you will have questions about hunting and calling coyotes. Just comment below on any of the pages if you have a specific question, just read through all of the tips before you submit! I can’t answer all of your questions on how to hunt coyotes, but I will do my best to respond, and write posts to answer the top questions asked. If you’re interested in a special topic, I’ll answer the best I can, or I’ll find the answer as long as it’s related to coyote calling and hunting. I’m hard at work building a state by state guide guide to predator hunting right here on the site. Look up your own personal state information, laws, and regulations. Keep up with local news and let me know if you find a news story in your state! If you want to feature a hunting contest in your state please contact me and I will post it. It really is a pretty simple process, but you must be disciplined. Finding the right locations and not wasting your time in over hunted or places where there’s poor habitat. Find those rich places and once you do, don’t over hunt them yourself. Put in the time and effort to find the best locations and then go on days when the weather is in your favor. I hate wasting a day in a prime area just because I wasn’t patient for the right conditions. Learn how to be stealth in your approach will be your best friend. After your in the right location, on the right day, being quiet will really be your greatest companion. I work so hard on this that it’s a habit for me. I constantly have to teach my hunting partners the practice of entering stand in stealth mode. Well the information on this page is just a primer for the full 101 tips. Jump up to the beginning or head on over to the next page in the tips section. Thanks for stopping by and good hunting! Before you get started, follow and subscribe to our social platforms for all the latest info and tips! Here’s where to find Us: Subscribe to our YouTube channel, Like us on Facebook, and Follow us on Instagram! 1. Be safe! Hunting is a lot of fun, and a great way to make memories with your friends and family. Take every precaution when dealing with firearms and wild animals. Coyotes and other predators are susceptible to disease so be careful when handling animals, and be sure to wear gloves while handling them. 2. Know The Law: Predator hunting regulations vary from state to state. Make sure you are hunting within the laws established by your state and county. Some states allow year round hunts, while others do not. Some require a permit, others do not. Some allow night hunting, others do not. Check your own state regulations and choose to abide by them. See all of the State Regulations. Water: Always bring lots of water, you never know what could happen, and many times you will be hunting in remote areas. It’s pretty cheap to buy water in bulk, or fill up some jugs and throw them in the truck. I like to buy a large pack of water bottles before every trip just in case that once in a lifetime emergency hits, and I need water! Here are two products that I keep with me almost all of the time. The first is the Life Straw. It’s a simple little straw with a filter built in. Just a few facts about it: Removes minimum 99.9999% of waterborne bacteria, and surpasses EPA standards for water filters. I recommend one for just $20. This is the Life Straw water bottle version. I keep this thing in my pack for hiking, camping, and of course all of my hunting ventures. It’s even better than the straw if you need to take water with you, rather than just drinking from the source. I’ve never had to use it in an extreme situation, hope I never do. This one runs around $30, and you’ll always see it on my motorcycle pack as well. They are great for any ADV. Food: Pack extra snacks, especially nuts and seeds. High calorie snacks can keep you alive if something goes wrong. If you are exposed to cold temperatures and moving a lot you’ll be burning more calories than usual, you’ll need to replace that energy with something. I’ve added some of my favorite hunting food that I typically pack with me. I really like to take MRE’s because they are so easy to fix. All you need is a little water to heat them up. The one’s I’ve listed taste really good too. Plus it’s like a fun little grab bag with every meal. Buy them in bulk to save yourself a little cost. If you don’t use them, they are great preparation for the zombie apocalypse. Gas up: Make sure you have enough to get to your honey hole and back. Know how much fuel your vehicle will accept, and how many miles you get per tank. It’s always smart to fill up before you hit the dusty road. I always pack this little no spill extra tank with me, just in case. Don’t cut a trip short because you know you won’t make it back if you go that extra mile. Fire: Put a fire starter and fire starting material in your pack or vehicle. You’ll be glad you did that one time something goes wrong. Test your fire starter before you’re in that life and death situation, don’t wait for it in the woods. First Aid: Anything can happen in the wilderness. Hopefully nothing goes wrong, but it’s nice to have something when, heaven forbid, something does go wrong. Pictured to the left is a nicer MOLLE pack that I like over the cheap ones at Walmart. This is another item that tends to find its way into my hiking pack, and on my dirt bike. Plus it’s camo! Tell Somebody: Where in the world you’re going! Pull up a Google Map and show someone where you are, and where you plan on hunting. Google Earth is a free download (great for scouting too), and it could save your life if you happen to go missing. I always tell my wife where I will be if I turn up missing. Looking forward to topics on this website. And will post tips , photos, and stories. I’ve have never been coyote hunting and my son and I would like to learn. Where would we start off first. We have the rifles to do this, but where clueless on what else we would need. I’d appreciate some pointers of where to start. Thank you! Foxpro electronic call… I would suggest the inferno but if you are willing to spend the money get the shockwave. You do not need an extremely expensive electronic call. I have a fairly nice one and some times the coyotes still only respond to a mouth call. I recommend a primos Randy Anderson “Hot Dog” for your first call. A gentleman recommended the Primos Hot Dog. I am n00b to coyote hunting, but I can tell you the Primos Lil Dog is a tad bit easier to use and reproduce the howls well, even as a n00b. Even if you do get an electronic caller, you need to learn mouth calls as well. I went out this weekend and had my first coyote hunt and experience, and the eCaller failed… the battery for the remote controller had died. Maybe because in my pack and in storage things pressed up against the buttons maybe? (Was my bad for not testing day before. Test, test and test again!) So I used the Primos Third Degree Rabbit Distress, the Lil Dog a few, and the Hot Dog a couple times. At about the 30-45 minute mark I decided to move location, decided to head up a nearby draw between two fingers. Son of a gun if it isn’t a coyote heading on down this draw bobbing and weaving thru the slalom of brush in it! It was a very windy day and I believe he wanted to attempt to get downwind of the call first. It happened quickly, first shot… trying to hit him below an opening in the brush, somehow I missed. It startled/stunned him. He didn’t see me, the Redhead 3D-Evolution Leafy camo suit worked awesomely! He stared right in my direction and didn’t recognize me as a threat! I think maybe his ears were ringing too. He was maybe 20-25yds when I shot. I slowly and quietly ejected and loaded the 2nd round as he turned to look elsewhere. He heard the last bit of loading that 2nd round… ran up to edge of the draw, stopped to look back my direction. I hit him. It straight-up rolled him and he dropped to his chest with his forelegs tucked-in doing like a TRex. He paused on the ground a bit, then… somehow…he got back up and then ran away! I STILL can’t believe it. The way I hit him and he rolled, I figured he’d run just a little bit and expire. Nope. I relentlessly blood-trailed him something like like 300 yards. Out of the draw… across the knoll… then down the sides of a steep Ravine down into the gully. But then at some point the blood trail just plain ended! And I mean I wanted that coyote BAD! I spent hours searching around the last blood sign. Looking carefully under all the nearby brush. I can only surmise the hit missed vitals (it was a quick incident, a standing offhand shot too.) and I’m curious if the lead-free 62gr Barnes TSX (.223 Rem) projectile perhaps didn’t expand as expected? Maybe due to coyote not being as thick as Deer/Hogs? I’m also wondering if perhaps the shot was above the spine? Since he rotated and rolled over like that upon being hit. I wondering if that might be because the shot was too high and thus the energy would be transferred more to the outside-edge of the “cylinder” of his body, if you can envision what I’m saying. I’m thinking maybe if the hit was lower, more where it should be, perhaps his body would have been more knocked sideways with less rotational force happening perhaps. Anyway, if they don’t drop like a sack of potatoes… learn from my mistake and hit ’em again, quickly! Good luck. DUDE. I AM IN MN AND LOOKING TO START THIS YEAR. How did last year treat you? Need all the info on hunting coyotes I can find. Willing to learn how. Hunting in Pennsylvania. What to do when coyote gets close then stops and will not commit but sets in one spot and barks.I’ve had this happen a couple times here in va. It could be a few things, my first guess is they saw you enter the stand, or maybe they saw your truck, or even may have winded you. I usually get that reaction when I don’t hide the truck well enough or expose myself walking in to the stand. It may also be that they’ve been called before and shot at. Change up the spot you’re sitting in if you can, change up the sounds, maybe a fawn distress, or bird distress, even a fox distress. Listen to a successful predator caller when coaxing that coyote that last little bit closer, or out of the thicket or tall grass. The squeaker mimics the shrill noises a prey animal such as a rabbit make just before they die. It sounds like the dinner bell to a hungry coyote. As long as your well under cover, haven’t been scented, or didn’t bang your barrel on the leg of you buddy’s stool, (all great reasons that he’s sitting there trying to dig you out of the brush with his eyes and nose! )you should be able to “squeak” a coyote in close enough for a good shot. A yote hanging up outside of your shooting range and barking has busted you in my estimation. I see this as them warning the others. A good way to locate is to drive around back roads after dark with a howler call. When one responds set up in the area the next morning. Awesome post you have here, it will surely help out beginners. I need help hunting coyotes in Idaho. Is an AR15 in 5.56 allowed to take a coyote in California ? Hello, I just wanted you to know that your statements about not being able to use magazines that hold more than 5 rounds for coyote hunting is wrong…you are telling people out there that they can’t do something that they can…..if you look on page 18 of the 2018 hunting regulation you will see where that restriction is stated, but you need to take notice that it is referring to GAME MAMMALS. on page 65 you will see under UNPROTECTED MAMMALS it states that Unprotected mammals ARE NOT COVERED under the game mammal, furbearer or sensitive species rules. I also have made contact with 2 game officers and they have said the same thing…so I think you need to change your sites information on this and if you read the regulations carefully you may find other mistakes as well. contacting the state game cops is also a good idea. not sure how much so for hunting, but we do allow suppressors.